Nicolaos G. Alexopoulos, Ph.D., professor emeritus and former dean of The Henry Samueli School of Engineering, has been named as one of the top 0.01 percent of highly cited scientists in the field of computer science by Web of Science, an online academic citation index provided by the Thomson Reuters Corporation. Alexopoulos joined the UC Irvine faculty in 1997 as engineering dean and professor in the Department of Electrical Engineering and Computer Science. 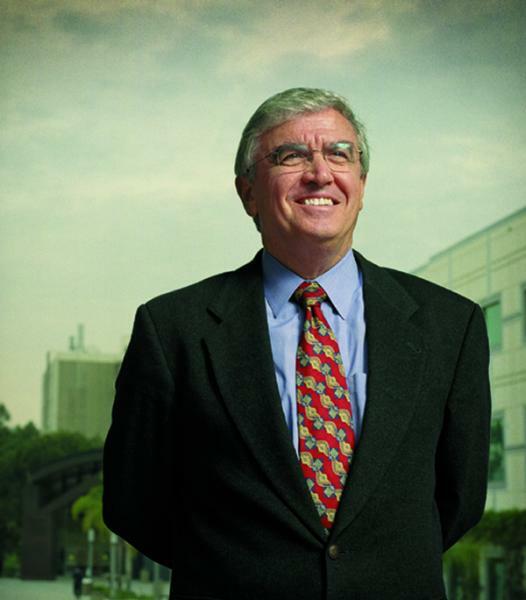 He was elected to the National Academy of Engineering in 2007 for “contributions to microwave circuits, antennas, and structures for low observable technologies, and for contributions in engineering education.” He retired from UC Irvine in 2008 and was named Vice President, Antenna and RF Research and University Relations in the Office of the Chief Technical Officer, Dr. Henry Samueli, at Broadcom Corporation. Alexopoulos’s papers that were published in the journals IEEE Transactions on Antennas and Propagation and IEEE Transactions on Microwave Theory and Techniques are used by commercial design software companies to check the accuracy of their design tools. The papers are what Alexopoulos refers to as “Five Benchmark Publications” where he and his students developed a “unified theory” for the holistic design of integrated circuits and antennas. Previous methods used design tools for integrated circuits based on quasi-static methods and different design tools for antennas. The unified theory treated integrated circuits as radiating structures; and this guided electromagnetic energy along the printed transmission lines and radiated at circuit discontinuities both in air and into the substrate. This approach allowed a holistic methodology to design circuits and antennas efficiently while taking into account all physical phenomena including cross talk. The benchmark papers also provided experimental verification of the design models. “The fact that we are cited in the top 0.01 percent verifies the usefulness of our work for the development and design of real products for high frequency technologies,” said Alexopoulos. From 1969-96, Alexopoulos served on the faculty of the Department of Electrical Engineering at UCLA, assuming the roles of associate dean of faculty affairs (1986-87) and chair of the department (1987-92) during his tenure. He is the author of more than 300 professional journal and conference papers, and 10 of these papers have been selected in special edited volumes as significant contributions in the field. He has served on the editorial boards of several professional journals and has been editor-in-chief of Electromagnetics. In 1985, he was elected Fellow of the Institute of Electrical and Electronics Engineers (IEEE), and has twice received the IEEE Schelkunoff Best Journal Publication Award (1985 and 1998). He is a member of the New York Academy of Sciences, and has received honorary doctorates from the National Technical University of Athens in Greece and in science from Chapman University, in Orange, Calif. Since he joined Broadcom in August 2008, he has given several lectures internationally, published several journal and conference papers and has filed more than twenty Broadcom patents. Born in Athens, Greece, he graduated from the Eighth Gymnasium of Athens in 1959, and received his B.S., M.S. and Ph.D. degrees from the University of Michigan at Ann Arbor in 1965, 1967 and 1968, respectively.